Posts: 1681 I've been staring at this one for quite some time. 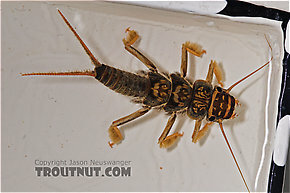 My first impression was lycorias (Boreal Stone, Giant Brown Stonefly). I'm pretty familiar with this species, but I don't know of a good key to Acroneuria at the species level. The lack of a row of spinules along the occiput of the head and presence of postocular and pronotal fringes all say Acroneuria for sure. Posts: 1681 Jason, I now think that this is probably abnormis rather than lycorias.